One of the most fundamental breakthroughs of Dianetics is the concise statement of the goal of life itself. 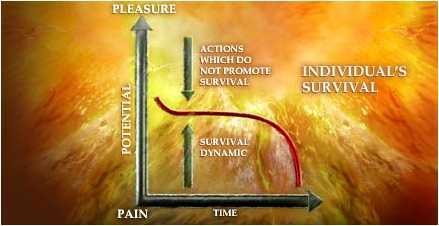 This, the dynamic principle of man’s existence, was discovered by L. Ron Hubbard. From this fundamental discovery many hitherto unanswered questions about man and life were resolved. The goal of life can be considered to be infinite survival. That man seeks to survive has long been known, but that it is his primary motivation is new. Man, as a life form, can be demonstrated to obey in all his action and purposes the one command: SURVIVE! Pain, disappointment and failure are the result of actions which do not promote survival. Dianetics techniques addresses these moments of pain and threat to survival, and it provides a precise technology to increase your ability to survive and live a happier, healthier life.